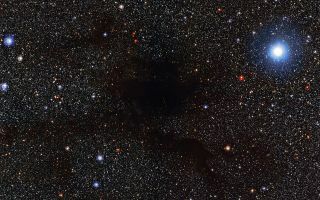 The Wide Field Imager (WFI) on the MPG/ESO 2.2-metre telescope at the La Silla Observatory in Chile captured this space wallpaper of dark cloud Lupus 4 blotting out background stars. The Wide Field Imager (WFI) on the MPG/ESO 2.2-metre telescope at the La Silla Observatory in Chile captured this space wallpaper of dark cloud Lupus 4 blotting out background stars. Lupus 4 is a dense pocket of gas and dust where new stars are expected to form. The cloud is located about 400 light-years away from Earth, on the border between the constellations of Lupus (The Wolf) and Norma (The Carpenter's Square).